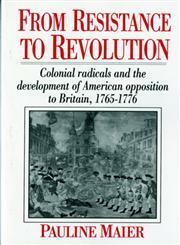 The Title "From Resistance to Revolution Colonial Radicals and the Development of American Opposition to Britain, 1765-1776" is written by Pauline Maier. This book was published in the year 1992. The ISBN number 0393308251|9780393308259 is assigned to the Paperback version of this title. This book has total of pp. 368 (Pages). The publisher of this title is W.W. Norton & Company Limited. From Resistance to Revolution Colonial Radicals and the Development of American Opposition to Britain, 1765-1776 is currently Available with us.